Must be following all author accounts (@acnbooks, @Kristen_granata, @vanessarasanenauthor, @bexjalise, @Lindseysablowski, @khallbooks, @ellelinder_books, @Lilnovelist, & @andreanourse). You know the drill. Do not follow to unfollow, or you will be banned from all giveaways. Like and Comment on this Photo on All Author Profiles. Must be 18+ or have parents’ permission to enter & share address. Ends Fri 11/29 at 11:59pm CST. Winner will be announced by 12/15/18. Only the ebook is available today. The paperback will be releasing next week. I had to order the proof to make sure everything looks ok, so the proof will be showing up November 21st. As long as it looks ok I’ll hit that publish button that very same day. So a little delay in the paperback, which is unusual for me, but I promise it’ll be out next week! And I’ll be posting again to share that news as well so you’ll have all the updated purchase links. I’ll be sharing more about this book throughout the day, but most importantly I just wanted to thank everyone. Thank you for your patience. This book, being now my 6th complete novel, was my hardest yet to write. It took me a while after Clara and Claire‘s release to get back on track with the sequel. And it took me much longer to finish the book than I expected. But here it is, we’ve made it to release day! And I couldn’t be more proud of the book I’ve released, that I can now share with you guys. It’s a story with more mystery than the first one, a story I was excited to tell and even more excited to share. I hope you’ll enjoy it. Stay tuned for the links to the paperback. And in the meantime, happy reading! Chaos erupts, suspects are arrested, and paranoid spreads like wildfire. All the while secrets about Nina’s past prove to be more twisted than anyone imagined. To say I’ve been eagerly awaiting the moment when I could share this cover would be an understatement. This book means a lot to me. I’ve been working on it for about a year now, and it’s finally coming to life. When I first went to Lori about the cover I told her I wanted it to give a mysterious feel to readers. I wanted someone to resemble Clara on the front, but I also wanted a forest in the background again –this time proving to be more dark and perhaps dangerous than the first one we saw on the cover of Clara and Claire. In Clara and Claire, Clara entered into world she knew nothing about. In the sequel Clara re-enters Ninomay, knowing more than she ever did before, but this time seeing how a murder affects the island and the people around her. I have so much to share with you guys about this book, and this is only a glimpse at what’s to come. If everything goes according to plan, I’ll be live on Instagram later tonight to answer any of your questions –without spoiling anything of course. As for the cover, go give some love to Hell Yes Design Studio’s page for the amazing work. And please, if you’re able to, share it around on your social media. The more people that see it, the more people will see this book is releasing this year. Thank you so much to everyone for their support today! 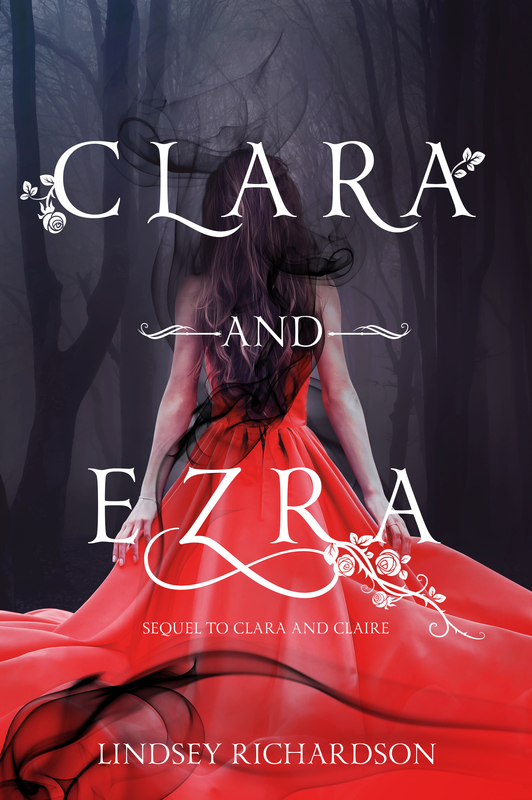 Clara and Ezra is officially up on Goodreads, so if you’re as excited for the release of this book as I am you can go ahead and add it your reading list. The official cover isn’t up yet, but I’ll be uploading that to Goodreads as well in October when I do the cover reveal. For right now the publication date says “November 2018,” so that’ll be updated when I have an actual release date set. But in the mean times I hope you guys will check it out. The official summary is up on Goodreads, so if you needed a refresher or you haven’t gotten a chance to ready the summary yet, please go check it out. Clara and Ezra is off to my beta readers for one final read through before I approve this for publication. Tonight I thought I’d catch you up on everything that’s happened with finishing the book, and everything that’s to come in the next two months with preparing the book for publication. I finished the 2nd draft of Clara and Ezra at 71,989 words. Now, at the end of the 3rd draft, I’m at an end total of 90,065 words. That’s a total of 18,076 new words that were added in from the 2nd to 3rd draft. It didn’t come easily and it sure as h*ll didn’t happen fast, but this book is finally where I want it to be. The third draft of this book made me realize a lot of things. One, I’m not a fast writer. I try to stick to a schedule, but sometimes I fall off that schedule, sometimes my muse hides from me, something I just don’t have the energy. And two, I’m finally happy with this book. When I finished the 2nd draft I knew I still had work to do. I wasn’t satisfied. I felt like so much was missing. The book was too short, and there were still parts I wanted to add in that had previously been left out. Now I’m finally at a point with this book where I can actually say I’m done. Hence, it’s off to my beta readers, so I can finally get someone else’s opinion besides my own. As for what’s to come next? While my beta readers have the book I’m going to be planning the cover reveal and starting work on my next project. It’s a secret for the moment, and probably won’t be revealed until Clara and Ezra releases, but I’m ready to dive into a new story. The cover reveal will be happening sometime in October. Before Halloween. I don’t have a date yet, but I’m working on it. If you’d like to participate in the cover reveal let me know and stay tuned. As for the release date, I’m still planning and hoping for a November release. Worse case scenario, I push it back to early December. But this book is definitely coming out before Christmas. And honestly? It needs to come out before December 4th because that’s the 2 year anniversary for Clara and Claire. That’s pretty much where we are with Clara and Ezra right now, and I’ll keep you guys posted once I have more to share. Thank you to everyone for your patience and support!